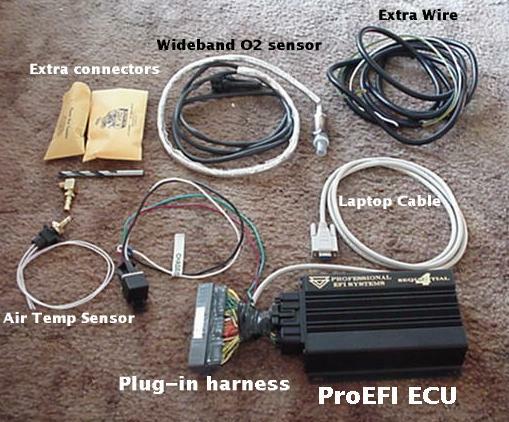 The Pro EFI Sequential 4 ECU is a stand-alone EFI unit that replaces the stock ECU with a fully-programmable (via laptop) computer. It can be configured hundreds of ways from the factory - ours converts from the stock Mass Airflow sensor type system to a Speed Density system. Once everything is installed and tuned, the restrictive stock MAF sensor can be removed, for a little extra power over and above the power better fuel and ignition control brings. Here's the Air Temp sensor installed in the intake manifold. Drill a 11/32" hole, tap it to M10 X 1.25, and screw it in with a little silicone to help seal it. To keep shavings from falling into the motor, I pulled the throttle body, and slid into the manifold "log" a long piece of cardboard folded into a "gutter" shape, and filled with about 1/8" of axle grease. Shavings fall onto this trap, and stick into the grease. 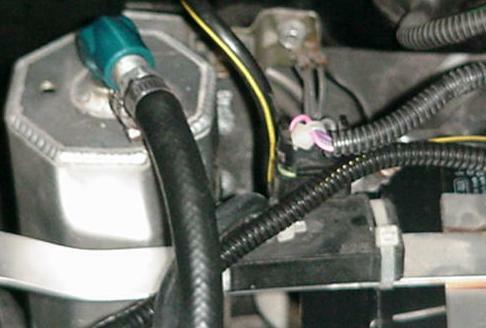 This is the MAP sensor, zip tied onto the battery hold-down strap. We use a lot of aluminum to keep weight down. That can with the blue fitting on it is the radiator overflow tank. 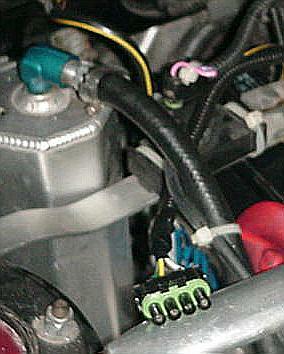 The MAP sensor hose taps into the BOV hose. The ProEFI harness uses some of the wires on the stock MAF sensor harness to hook up the new sensors (to save having to cut holes in the firewall) But we want to be able to switch back and forth between the stock ECU and the ProEFI ECU until we're confident that the ProEFI ECU is tuned. 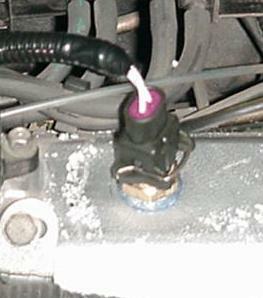 This is the new plug, near the stock MAF sensor plug, that connects the new sensors. The new harness is purposely set up too short to allow both sensor connectors to be connected at the same time. No sense zapping the new toy! 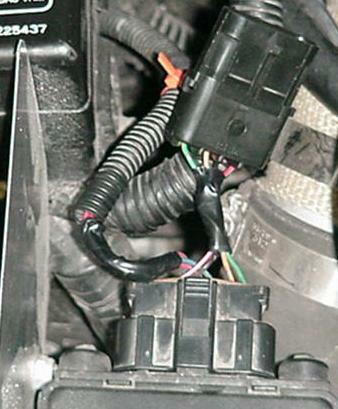 Here's another shot of the MAP sensor, with the new sensor harness end in the foreground.